High Efficiency Particulate Respiratory Protection Systems are used in a variety of applications & industries including for Welders. The 3M Adflo 37-1101-00SW is Lightweight and Compact in design. 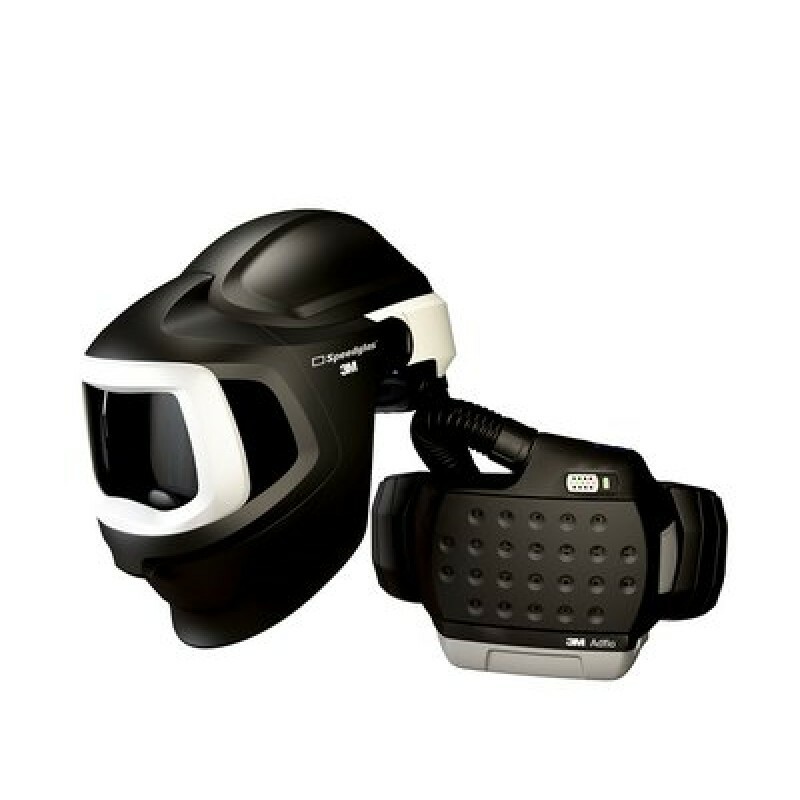 This PAPR includes a 3M Speedglas Welding Helmet 9100MP which provides Overhead Protection and increases Peripheral Vision. Auto-Darkening Filter can be used for extra protection (Sold Separately). Filter Cover: Holds the user-Replaceable Spark Arrestor. Prefilter: Increases the service life of the Particle Filter. Particle Filter: High efficiency Particulate Filtration. Gas Filter: (A1B1E1 or A2) captures Organic, Inorganic and Acid Gases and Vapours. Gas Filters Sold Separately. Odour Filter: Removes unpleasant smells (not needed if a Gas Filter is installed); sold separately. Li-ion battery: Fully Charges in 4.5 Hours. Expected Operating Time is 8 Hours with new Particle Filter, new Fully Charged Battery and a Standard Airflow. Filter Indicator: Indicates the status of the Particle Filter. Airflow Plus: For hot, humid jobs, you can increase the airflow from 170 l/min to 200 l/min with the push of a button. Breathing Tube: Self Adjusting or Heavy Duty Rubber. Exclusive Airflow Pattern: Evenly distributes Filtered Air throughout the entire Breathing Zone of the Helmet. The Intelligent Turbo unit keeps the Airflow Rate at a constant, preset level. A Diffuser spreads out the Airflow Pattern for your maximum comfort.